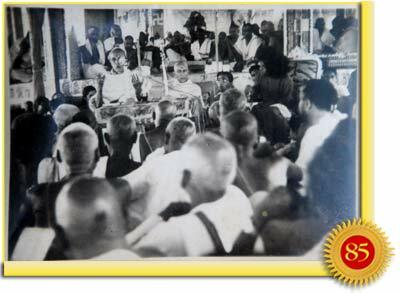 In 1957, Sathya Sai Baba presided at the 9th All-India Divine Life Convention held at Venkatagiri. It was a landmark event aimed at reviving the glory of Indian culture and spirituality within a decade of the end of British colonialism. The town of Venkatagiri was filled with delegates, visitors, and devotees. There were a large number of renunciates from far and wide. A gorgeous flower-bedecked palanquin was placed at the main gate of the Venkatagiri Palace for Sai Baba to proceed into the theatre for the first session. When Baba came out and saw this symbol of pomp, He politely refused the honour. The Raja of Venkatagiri tried to get Baba to reconsider, but He said: "There are so many monks here; I would like to walk with them." It was indeed a distinguished galaxy of holy men, including Swami Sadananda, Swami Satchidananda, Swami Atmaswarupananda, and Swami Srinivasananda. In His keynote address, Baba said that divine life was the inspiration, the birthright, the motive force, the be-all and end-all of everything in creation; from microcosm to the macrocosm. Divine life is the rain that falls from the clouds of truth, love, and non-injury. It comprises all acts done in the pursuit of reality. Just as butter is within milk, inside every individual is the desire to attain divinity behind the illusion of material things. As one churns milk to separate the butter, man must stir his mind with good deeds and noble company. The mind of man oscillates between the eternal spirit and the fleeting world. Therefore, it is the duty of societies such as the Divine Life Society to fill the minds of its members with holiness, and help remove the dross of passion and lust. For this transformation, everyone is a worthy candidate, and the taste of that bliss is the same for all. On the third day, after the meeting was opened to the public, Baba spoke for over an hour, encouraging all to lead lives of devotion and surrender. "What would you like to be in the hands of the Lord?" He asked. He Himself suggested the answer, "The flute." He wanted everyone to move forward without any crookedness, shorn of any pride, ego, will, or idea of self; worthy of inviting God to pick it and blow His sweet breath through it, creating a divine melody. Baba moved freely among the holy men and scholars and gave each a long interview before departing from Venkatagiri. When Baba returned to Puttaparthi, He was joined by Swami Sadananda and Swami Satchidananda. They were both eager to spend more time in the Divine Presence. 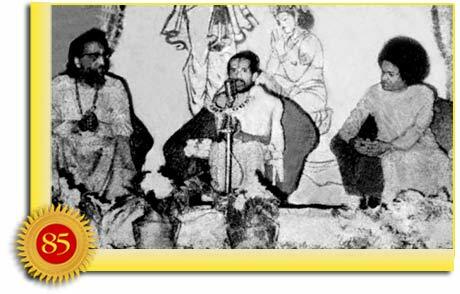 Swami Satchidananda spoke at a meeting in Puttaparthi at the inauguration of the Meditation Grove on June 29, 1957. He said that whatever others may take Baba to be, he was convinced from personal experience that He was Super Consciousness itself, Omniscient, the motivation of beings, the Inner-Resident of all beings. He and Swami Sadananda wrote to their Guru, Swami Sivananda Saraswati of Rishikesh, about Baba and His divine attributes. 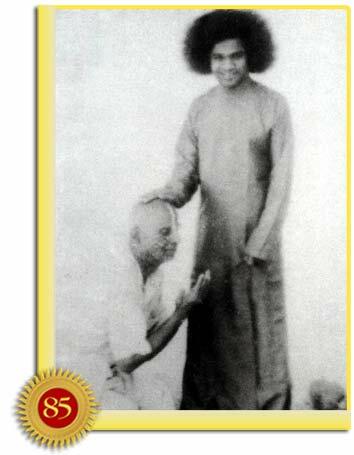 The two Swamis travelled with Baba to Cape Comorin. There they had a glimpse of Baba's universal message when they saw Him creating a rosary with the Holy Cross and the figure of Jesus Christ in order to bless a Christian. When Sai Baba walked along the sands of the seashore at Kanyakumari, crystal beads formed themselves at each step; these were collected by the devotees. There were 84 of them. Baba said that there must be 108 in all. On counting again, their number tallied with 108. A japamala or rosary was made from the beads. Baba gave the miracle necklace to Swami Sadananda. After visiting the Periyar Dam and the Wild Life Sanctuary there, Baba proceeded to Madurai and Mayuram, and returned to Puttaparthi by way of Salem, where Swami Satchidananda had stayed for some years. It came about that Baba had received a letter of invitation from Swami Sivananda Saraswati, President of the Divine Life Society, in Rishikesh. This was vigorously followed up by many reminders and telegrams in quick succession. Baba finally agreed to go to North India, despite the fact that He has no need to go on tours as He is beyond space and time. After reaching Madras, now known as Chennai, mid-July of 1957, Baba and His devotees boarded an airplane that landed at New Delhi’s Palam airport (now Indira Gandhi International Airport) at 4:30 p.m. Within an hour of His arrival, Baba went into trance to answer a distress call from a devotee in the throes of a dangerous paralytic stroke. During the week or so that He stayed in Delhi, Baba filled the hearts of devotees with joy; people came in hundreds and they were only too glad to attend the bhajan sessions twice a day. 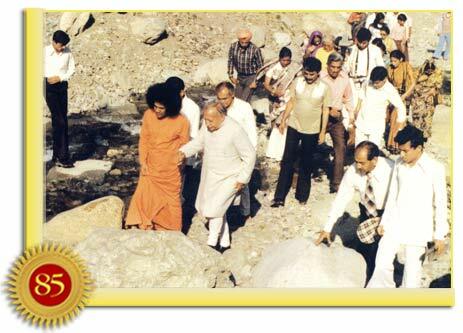 On July 22, 1957, Baba left New Delhi by car for Rishikesh. When He reached Sivanandanagar at 6:30 p.m. that evening, Swami Sivananda called for a special gathering of the disciples at the ashram and offered Baba a hearty welcome. While Swami Sivananda greeted Baba with folded hands, as was his custom, Baba acknowledged the greeting with His posture of the Hand which means, "Do not fear," a sign that has given peace to countless troubled souls. Baba also spoke on the word "Bhagavan"—an appellation by which He was introduced to the gathering. He said that Bha meant "creation," Ga meant "protection" and Va meant "change" or "transformation." "Bhagavan is capable of all three. That is My secret," He announced. On July 26, 1957, Baba boarded a bus and proceeded along the bank of the Ganges to the palace of the Rani of Garhwal for a quiet morning. After passing through some elevating scenery, the bus halted in front of an artistic little bungalow--centered like a gem--in a well-kept garden beside the Ganges. Some asked Baba questions that were troubling them. In response to a query on what is the nature of scriptural writings and their value to modern times, Bhagavan said they were like sign posts indicating the road; the path has to be traversed in order to experience the joy of reaching the goal. Someone else in the crowd asked a question on the existence of heaven and hell. Baba said both exist here in this world. Later, Baba "left" His Body, as it were, for a short while. When subsequently asked where He had been, Baba explained He had gone to save a great Yogi from a watery grave. This aroused the curiosity of everyone around Him and they gathered closer to hear further details. He brushed their questions aside and said that Subramanyam would be able to say who it was! Later Subramanyam, a member of the party, was asked by Baba what he had seen that evening while at the cave. Subramanyam begged pardon for not informing Baba immediately about it, for he had seen a corpse floating down the Ganges but being a sign of evil omen, he had refrained from mentioning it in the holy atmosphere of the cave. Baba laughed and said it was not a corpse at all, though the Yogi who was floating down the flood was so dead to all external appearances that he did not even realise his plight. He was being swept down by the torrent. It was said he was seated on a rock by the side of the river, lost in meditation. The current, meanwhile, was fast eating into the mud underneath the rock that tilted over, throwing him into the flood. "It was all like a dream for him at first," said Baba. Later, when he found he was being carried away by the Ganges, he began to pray to the Lord. Baba heard his call; He slowly led the floating Yogi to the bank, a few miles above Sivanandanagar where there was a homestead available to give him warmth and comfort. Raja Reddy, who was at Rishikesh, shares: "We heard Him narrating the incident. During the 'trance', He had His palms one over the other as if enclosing something. It was to protect the Sanyasi's heart that Baba had kept His fist closed. The yogi was saved after a 30-mile float!" 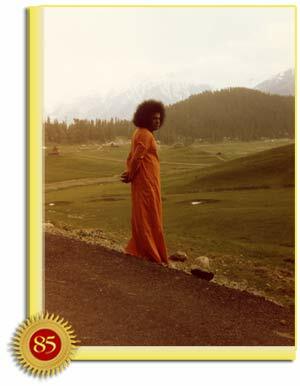 This incident of the unknown Yogi demonstrated Baba's Universal Love and Presence. Baba left Swami Sivananda on July 28 and went to New Delhi. On 30 July, He proceeded by car to Mathura-Brindavan, the scene of His past Divine Career as Lord Krishna. Baba led them all to the bank of the Yamuna, as if He knew every inch of the place, and pointed out to the hallowed localities. 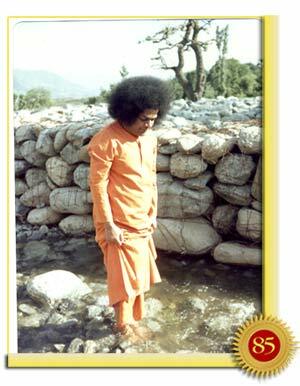 Who can say what reminiscences were activating the Consciousness of Baba as He showed the places where the serpent was humbled, the Gopis were chided, the cart was overturned, the twin trees were plucked. Every little wave of the Yamuna seemed to dance to the music of His Voice; every cow that was seen seemed to be seeking the warm touch of His Divine Hand! While returning to Mathura, Baba casually walked into a Radha-Shyam Temple where Krishna and the Gopis were worshiped. Arrangements were being made in front of the temple for a Rasaleela Show, a play on the "Dance of Krishna among the Gopis" in which He appeared as many Krishnas. When Baba went and stood in front of the shrine, suddenly the lights went off; everyone wondered why! Baba said, "Don't worry; we shall take this idol of Krishna to Delhi and you can perform your adoration to it there!" He waved His Hand across the door of the shrine where one could see the lovely marble image of Krishna in the dim light - in His Palm there materialized an idol, the exact replica of the one installed inside! 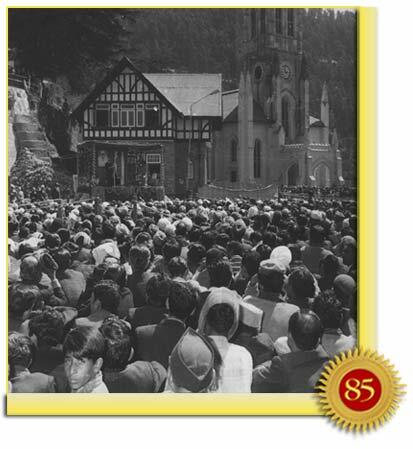 On 2 August 1957, Baba left for Srinagar by plane and reached the Kashmir Valley at noon. From the air, one could see the complicated network of canals that feed the Punjab plains, the Golden Temple of Amritsar, and the rugged approaches to the Banihal Pass and the Kashmir Valley. Baba stayed in a houseboat named Alexandra Palace. His party occupied two neighbouring boats known as the Prince of Kashmir and the King's Roses. 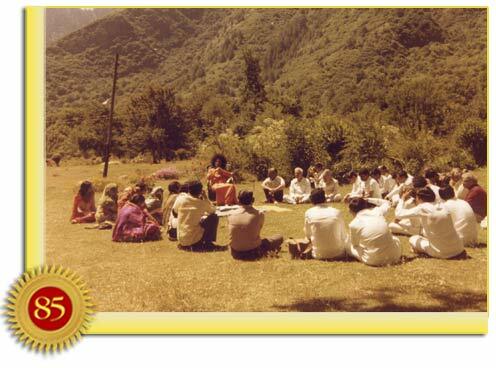 Baba encouraged everyone to appreciate the beauties of nature. He directed their attention to the charm of flowers, the colours of sunset, the gray grandeur of an overcast sky, the twinkling stars in the midnight sky or the jasmine-garland of cranes in flight. He took the party to the famous Mughal gardens - Shalimar and Nishat Bagh in the evening, but as He remarked while returning to the houseboat, the snow-covered Himalayas in the far distance were a far lovelier garden designed by the Lord to draw men's eyes away from the valleys in which they wallowed. On 3 August, Baba departed for Gulmarg and Khilanmarg to show His party the snows of the Himalayan Ranges. They mounted horses at Tangmarg. During the 12-mile climb to 14,000 ft. above sea level, Baba kept the party entertained with His quips, jokes, occasional gifts, or ash. He rode His horse, Raja, the tallest and most impressive of all, with ease and dexterity. Never once did He get down to rest. The road wound over the hills. It was full of pebbles, broken cobblestones and the tangle of pine tree roots, but the horses cleverly picked their way along until the snow line was reached. Baba, barefoot, played in the snow, rolling balls of ice and throwing them at the party, laughing at the frightened faces of those who slid down the snow banks in makeshift toboggans and chiding those who complained of the chilling wind. Everyone was tired and complained of aches and blisters, but Baba was fresh as a rose when they returned to the houseboats at about 10.30 p.m. that night. Many from Srinagar came to the Alexandra Palace to receive Baba’s blessings. An old lady said she had been directed to go to that very boat by some messenger in a dream she had the previous night. Baba accepted the invitation of a few families in Srinagar to visit them in their homes. At one such home, He placed a garland around the neck of a baby, saying, "He will become a great Yogi!" That was the house of the secretary of the travel agency that had made arrangements for Baba's tour of Kashmir. Baba gave him a ring, set with gemstones, which He materialised on the spot. During the conversation, when someone asked Him at what age He had "given up hearth and home," Sai Baba quipped, "How can I, whose home is the world, give up hearth and home?" The stream of questioning pilgrims to Alexandra Palace continued unabated for two full days. Baba's answers illumined the Divinity of His Being. His leave-taking was painful for the large throng of devotees who had come to the airport on 6 August. The plane finally departed for Delhi. Next Baba flew to Madras for a short stay and reached Puttaparthi on 14 August. Today in hindsight, it appears that His very first trip to North India not only brought throngs of seekers to Sai’s hallowed presence, but through His holy tread on the soil there, Baba energised the sacred centres in those regions. This was the practical extension of the Conference He had presided over at Venkatagiri earlier on to revive India’s timeless heritage and values. Barely a decade old independent country, Bharat was being awakened to a new dawn by the young Sathya Sai.